Malted waffles have long been a tradition in local diners and soul food restaurants, and now you can enjoy our special ‘secret recipe’ version of this breakfast favorite right at home. Enjoy these decadent waffles with fruit, jams, maple syrup, or any favorite topping. 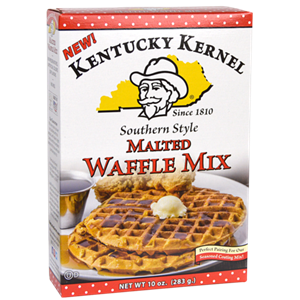 And of course,Kentucky Kernel's southern-style waffle mix is the perfect choice to pair with spicy fried chicken for ‘Chicken n’ Waffles’ – especially when cooked up with Kentucky Kernel Seasoned Flour! "ENRICHED AND BLEACHED WHEAT FLOUR (WHEAT FLOUR, BARLEY FLOUR, NIACIN, IRON, THIAMIN MONONITRATE, RIBOFLAVIN, AND FOLIC ACID), CORN FLOUR, SUGAR, MALTED MILK POWDER (MALTED BARLEY, WHEY, MILK, WATER, HYDROLYZED WHEAT GLUTEN, BAKING SODA, SALT), BUTTERMILK SOLIDS, MALT EXTRACT, LEAVENING (BAKING POWDER, BAKING SODA). ","ENRICHED AND BLEACHED WHEAT FLOUR (WHEAT FLOUR, MALTED BARLEY FLOUR, NIACIN, IRON, THIAMIN MONONITRATE, RIBOFLAVIN, AND FOLIC ACID), CORN FLOUR, SUGAR, MALTED MILK POWDER (MALTED BARLEY, WHEAT, MILK, WATER, HYDROLYZED WHEAT GLUTEN, BAKING SODA, SALT), BUTTERMILK SOLIDS, MALT EXTRACT, LEAVENING (BAKING POWDER, BAKING SODA)."